What Does Open Source Mean? Technically speaking, open source means freedom of knowledge. Freedom in this instance means that open source knowledge is accessible to one and all, and that this knowledge can be used for any purpose. It also means any product built from open source knowledge, whatever form that product may take, can be modified under the guide-lines of permissive licenses. Without the burdensome demand made by closed source knowledge to seek formal consent each and every time one sees an innovative advance to an existing artifact. Closed source knowledge provides no guarantee such consent will be extended. Open source makes it possible to produce totally unrelated products or services that would simply not be viable under the restrictions presented by current intellectual property protection. In the wake of creating these new products and services, come job opportunities that otherwise would not see the light of day. Originally coined to describe all restriction free computer software code, the term, Open Source, with it's warm and appealing connotations and implications has been adopted to encompass all freely accessible and exchanged knowledge from disciplines of every persuasion. Even beer!! Good Humans value and respect responsible freedom. Open source knowledge and the right to use it is contributed by forward thinking, principled, freedom minded individuals from all walks of life. All walks of life Include Business, Private, Industry, Government, and Military. These individuals foresee that to secure Humanities future we must all work together. Sharing resources inclusively - in unison and reciprocally - is a guaranteed path to peace and prosperity. This progressively widespread Good behavior is inspiring, exhilarating, encouraging and provident. Because it is the right thing to do. And can be readily recognized as so. Doing the right thing is one powerful platform to be working on. 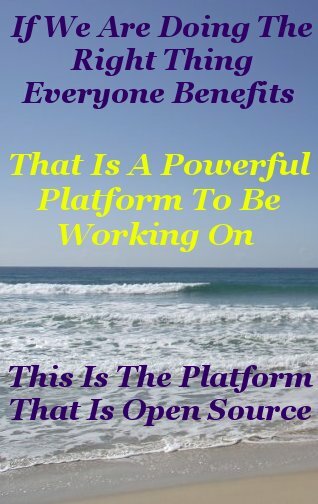 This then is the platform that is Open Source. Representing the essence of sharing, Open Source Knowledge presents intelligent collaboration opportunities spanning seven billion minds from the four corners of the Earth. The greatest danger to Open Source is exactly the same evil that distorts every philosophy experimented with by Humanity. That evil is the desire to dominate others lives. At the heart of open source are principles that allow the concept of Freedom to work so effectively. If these principles are corrupted, or not strictly adhered to, open source will gain the same ignominious reputation as it's selfish closed source counterpart has from misuse and abuse. And, sigh, we will be back to square one, where the few control the lives of the many. Vigilant against abuse we must be. These principles that allow open source knowledge to remain open can be found in the philosophy of Personal Development. Available, as is open source knowledge itself, to all who seek to understand just how to make Good things happen. Open source not only frees the Human Spirit, but it frees Enterprise of every description to go ahead and use knowledge for whatever purpose desired. Often used in entirely independent ways to the intention of a patent or copyright that would lock up whatever knowledge was used to produce it. In other words alternative uses of this locked away knowledge has no detrimental economic impact on those products from whence it was borrowed. The net effect of forward thinking in this sharing manner is a multiplying, broadening, cross-breeding, and propagating of knowledge in an unstoppable cascade of creativity. Promoting an intense sense of decency. If we want more jobs, leading to a higher standard of living, what better way to generate them than via Open Source? 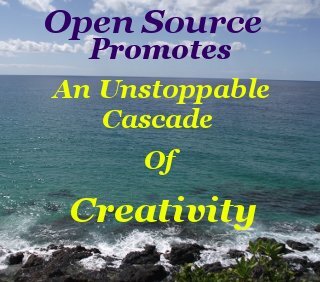 For Open Source to work effectively, seamlessly, and be a genuinely feasible alternative to the restrictive practices inherent in Patents and Copyright, it must be truly free. Simply put, truly free means any work placed under an open source license can be used for commercial purposes. I readily acknowledge this is a huge step. However, commerce is our life-blood and as such it is our individual birthright to participate, contribute, and profit from commerce that underpins and supports the vitality of Humanities progress. 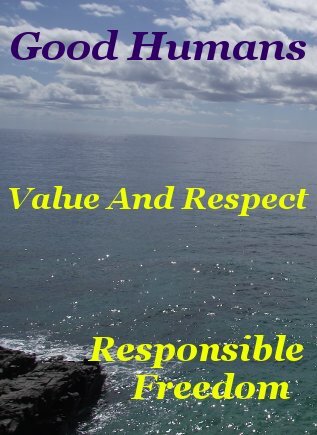 Personal Development provides the necessary tools to make 'truly free' - in every respect of the term - a reality. This web-site's author agrees and complies with this very sensible requirement of truly free. To me, this is the heart and soul of sharing. Humans need viable, vibrant Economies to thrive. Courtesy of Open Source in the wider definition expressed here, we now have the means to achieve stable, viable, vibrant industry. Whether companies consist of a single individual or thousands. Vibrant Industry powered by individuals ably determined to collectively do the right thing.